There are things in the world that are quite certain. That I will never win the lottery, no matter how many times I try, for instance. There are things that are less certain and may turn one way or another. There are also things that are not certain at all. And then there is the weather in Filzmoos. To give you today’s example, “a sunny cloudless morning with some showers and thunderstorms in the mountain area from 15:00 and a 99% chance of rain around 23:00” in reality meant nothing else but a cloudy morning, an annoying rain between 10:30 and 11:30 and a wonderful sunny weather for the rest of the day. As I am writing this, it’s 23:30, and the 99% probability of rain has not materialized yet. Perhaps I should start buying my lottery tickets in Filzmoos. Anyway, the reason I am telling you all that is because the day could have developed very differently had I not believed the forecast. I would have leased an e-bike, for example, and rode to the one of the two Sulzenalm huts. 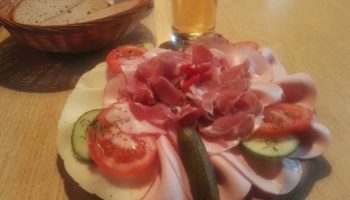 After a small snack there, I would have proceeded to the Filzmoos’s famous Hofalmen and had a Brettljause at the Unterhofalm (the Oberofalm having been tested and thoroughly enjoyed yesterday). Instead, I decided to walk (having an umbrella open is so much easier when one does not ride a bicycle), and ended up eating at Sulzenalm’s Wallehenhütte, and then visiting my good old marmot friends at Bachlalm before returning to Filzmoos just in time for a late-evening pizza and lots of wine. If the Hofalmen are quite clearly Filzmoos’s main tourist attractions, the Sulzenalm remains a bit of an open secret. It’s reachable by car, but one needs to do some basic research beforehand. It’s also reachable by bicycle and by a number of footpaths. It’s a really old and traditional pasture, with only four farmers using it now; two of them have huts serving foods and drinks. View-wise, Sulzenalm is vastly superior to the Hofalmen, in my opinion, and is quite on-par with them Brettljause-wise. Cheeses first. Three types of them were on offer, and two – some thinly sliced boredom and a much more enjoyable but only marginally tastier goat cheese did not really cut the mustard (also present). 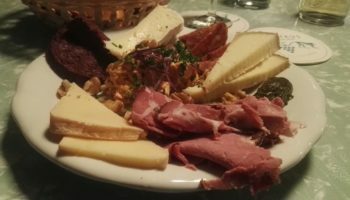 The garlic cheese, much creamier than at the Schwaigalm, stole the show, however, and I would have easily had it with the bread and butter alone. Oh, the butter. 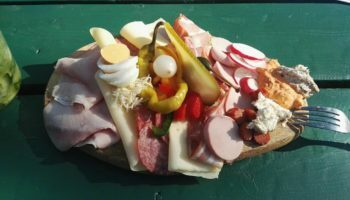 There is a helpful website (see above – it’s the only “official” site of the Wallehenhütte anyway), which lists what one should try at each of the huts (no recommendation says “Brettljause,” so I follow my own instincts). 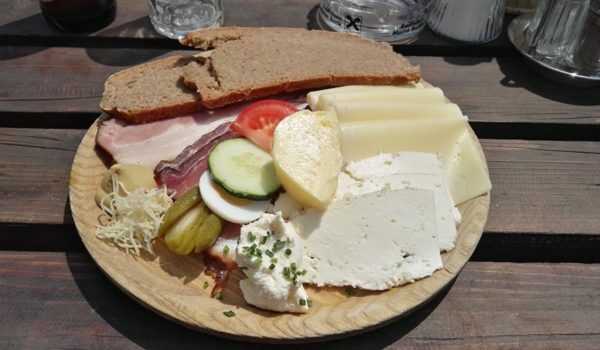 Well, in the case of Wallehenhütte, it says “bread and butter,” and although the bread is quite boring and not too fresh, the butter is truly great. It’s served a bit melted (intentionally or not), and actually has a really pleasant taste. Normally, one does not want butter to have taste, but this is a notable exception. 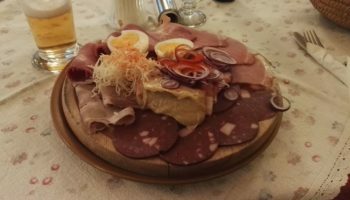 Moving on to the meats, the two types of thickly-cut Speck were brilliant, worth being part of any great South-Tyrolean Marende. 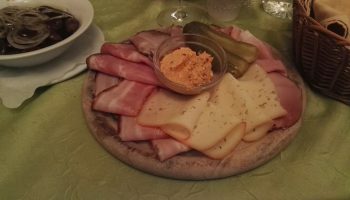 I really liked the Geselchtes, too, though am still in two minds about the thick slice of the round fatty sausage. Overall, however, it was a very authentic Jause, maybe even more so than the more varied and heavier one of Oberhofalm. I have to mention the kittens, of course. While eating, I had the pleasure of watching three kittens (red, red-white and black-red-white) playing, and would have happily paid the full price for that show even if the Brettljause and the beer had not arrived. Wallehenhütte is a very happy place indeed, and is highly recommended to anyone who wants to have their mood improved. By the way, at 00:15, as I am finishing this review sitting on my hotel’s balcony, it’s very fresh and raining heavily. I have also won 6 euros at the lottery, having paid 10 for the ticket. Let’s call it a success.